New Zealand's unique wildlife is the subject of the content-rich sister sites for Pterodroma Pelagics and Kiwi Wildlife Tours. At the same time as serving the business objective to generate tour bookings, the sites offer a mine of educational information. Graphic design for these sites is by site owner Chris Gaskin. 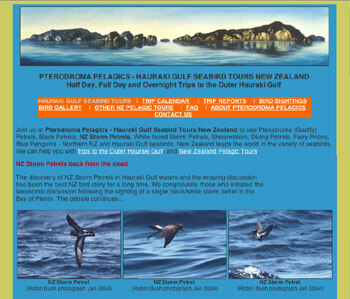 Pterodroma Pelagics has a harmonious visual design and focus specifically on endemic New Zealand seabirds. The Trip Calendars and Bird Sightings Calendars have been purpose-built by @URL, and show at a glance scheduled trips and when and where rare birds have been sighted. Both are updated by the client. The sister site, Kiwi Wildlife Tours, offers online booking for specialised eco-tours, featuring birdwatching and other activities. Up-to-date price, date and availability information is supported by field notes from previous trips, FAQs and stunning photographs. Each page features a downloadable audio clip of a native bird call.